Hello! I have great news to share! 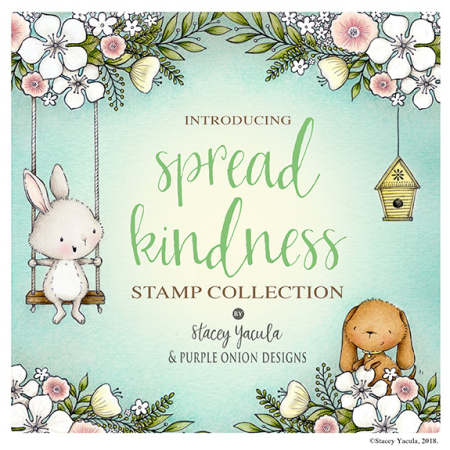 Today is the day of the spring stamp release ~ Spread Kindness, illustrated by the very talented Stacey Yacula. They are now available at Purple Onion Designs! Spread Kindness consists of two distinctive stamp styles that work perfectly when mixed together. The larger sized stamps are also ideal to be used on their own. It's an amazing collection that you can come up with many varieties of cards and projects! There are also two new sets of sentiments that coordinates with Spread Kindness collection. Essential Thoughts, which is a new addition to the Essential sentiments series and Kindness sentiment set (which I really love!) consisting of 17 large sized sentiments in two different fonts. And here is a card I made using some of the new from Spread Kindness. 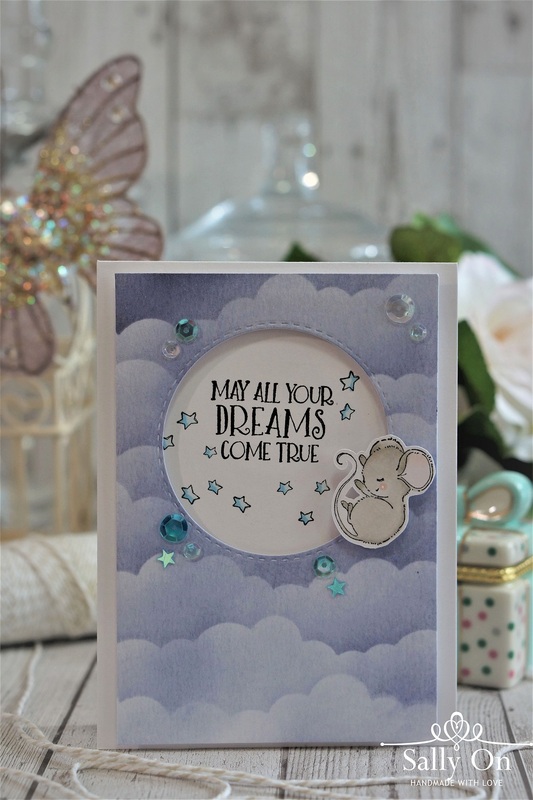 Eve is one my favourite stamp from the Spread Kindness collection as she makes me think of sweet dreams in a good night's sleep. Therefore, I matched the sentiment of "May All Your Dreams Come True" for the card. The dreamy night clouds background was created using the Mini Cloud stencil from My Favorite Things and a light blend of distress ink in Chipped Sapphire with the ink blender. I coloured Eve and Twinkling Stars with Copic markers. To replicate the stars in the night sky, I added some clear and blue sequins, and blue stars for that extra shine. From today until Friday, 22 June 2018, you will be able to purchase the Spread Kindness collection, with an option of 3 different bundles to choose from. Bundle 1 ~Purchase the entire Spread Kindness collection (26 stamps) at $105.00, which is a savings of 30%. Bundle 2 ~ Purchase the critters and coordinating stamps (18 stamps) at $71.00, which is a savings of 20%. Bundle 3 ~ Purchase the traditional images and florals (8 stamps) at $48.00, which is a savings of 20%. I hope you like the card I've shared today and I hope you can check back in a couple of days' time as I'll be sharing another card created using another few stamps from Spread Kindness. Please remember to head over to Purple Onion Designs blog to check out more details of the Spread Kindness bundles options and also to be inspired by all the gorgeous cards created by the talented group of ladies from the design team!